Following on from our Faith in Action articles of a Wednesday, we have decided to add a new article which highlights men and women of faith as written about in the bible. We hope that from our faith-filled Wednesdays you will become encouraged and step out greater in faith. Then the scripture says Enoch with God 300 years and father sons and daughters. So Enoch life lasted 365 years. 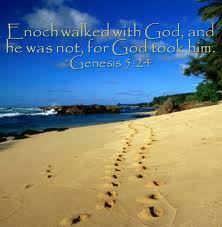 Enoch walked with God, and he was not there, because God took him. What a testimony to walk so closely with God, which was also acknowledged by the author of Genesis, that God took him. It makes one think what did Methuselah do, that was not the same as his father Enoch, that God didn’t take him. but instead let him have the record for the oldest person to live. Methuselah did have a legacy, his son was Noah, who was to do great things for God by building an ark. So what makes Enoch different, that he was known as a man who walk with God. I suppose we will never really know, but Enoch mast have one of the best testimonies in the Bible. Sure times are different, but God is the same yesterday, today and forever. Let us all inspire to be known as people who walk with God, and by walking with Our Lord and Our friend, others will have the privilege to know Him that intimate way too. Not much is said about Enoch in scripture, but what was said about him, is something we all should be wanting to be known for.